I am happy to be present here today at this premiere Maintenance Depot of the Indian Air Force to award Colours to Air Force Central Medical Establishment and 3 Base Repair Depot. Both these establishments have distinguished themselves in the service of the nation. They have a rich history of professional excellence and have served the nation with honour and distinction. For their devotion, professionalism and exceptional service, the nation honours them today, by awarding them Colours. This is an expression of gratitude and appreciation for the exceptional services they have rendered the nation. I compliment the fraternity of Air Force Central Medical Establishment and 3 Base Repair Depot for this recognition. As the proud guardian of our sovereign skies, the Indian Air Force has been discharging its duty with fortitude. The brave air warriors have been engaged in undertaking a whole range of crucial missions for the nation. They range from disaster relief operations to supporting counter-insurgency operations. As our country moves ahead on the path of economic progress, it is essential to preserve peace for which we need to maintain an effective deterrence and a strong defence capability. As a nation, we are fully committed to maintaining peace and we are steadfast in our belief that the resolution of disputes should be through discussion. 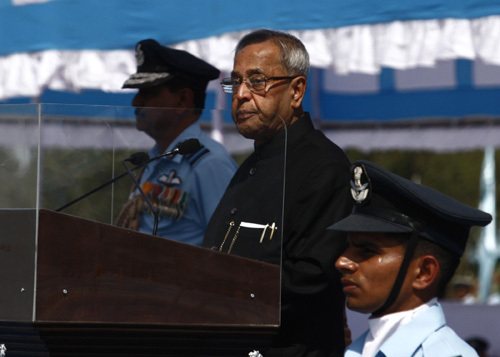 But at the same time, we would need to be prepared to face any aggression and safeguard our territorial integrity with all our might, and the Indian Air Force has a critical role to play in this effort. They have in the past risen admirably in defence of our nation with valour, courage, devotion and fearlessness. The men and women, who stand before me today, are the proud sons and daughters of mother India. They have vowed to lay down their lives for the defence of our motherland and thus symbolize patriotism of the most noble kind. They uphold the highest standards of the defence forces and I congratulate them for their devotion and discipline. I also take this opportunity to congratulate the air warriors on parade today, for the exemplary impeccable drill, turnout and discipline. The Air Force Central Medical Establishment is a premier medical establishment of the Indian Air Force. The unit was first established by the Royal Air Force as the Central Medical Board at Lahore in 1940. The creation of the establishment was a recognition of a necessity for standardized procedures for selection and subsequent medical assessment of aircrew. The primary role of the organization is to provide comprehensive medical assessment of aircrew of the armed forces, paramilitary services and the civil aviation industry. The unit personnel, both past and present, have relentlessly pursued excellence and have set standards that are worthy of emulation. I am happy to note that in 2005, the unit achieved the rare distinction of becoming the first unit in the Armed Forces medical services to acquire an ISO 9001:2000 certification. The unit has achieved excellence in providing quality aero-medical care and continues to set higher benchmarks through perseverance and hard work. I am confident that the unit will continue to serve the nation selflessly in the years to come. No. 3 Base Repair Depot has completed fifty glorious years of service to the nation. I am happy to know that ever since its inception in 1962, the Depot has discharged its duty zealously and functioned as a major repair and maintenance support unit of the Indian Air Force. The role that they play in the defence preparedness of nation cannot be exaggerated. Nations may have the most sophisticated platforms, but their effective deployment will hinge on the quality of repairs and maintenance of aircraft and their various equipment. With increasing sophistication of aircraft and their avionics, the role of repair and support organizations has become more critical than ever. The aircraft that we can deploy and their lethality will depend on the efficiency of such organizations. The No. 3 BRD has distinguished themselves in playing this crucial role in 1965 and 1971 when the nation was compelled to defend itself. Besides playing the crucial role of repair and support, the 3BRD has several other achievements to its credit. The BRD has undertaken successfully the difficult task of life revision of aero engines without involving the original manufacturer relying on indigenous technology. Many contemporary technologies have been utilized on helicopters and aero engines for the first time in the country at 3 BRD, and this has substantially contributed towards minimizing our dependency on foreign sources. The Depot continues to strive to attain complete self-reliance in helicopter maintenance and provide quality maintenance support to the field units. I have been informed that the Depot is presently handling the induction of newly acquired state-of-the-art Mi-17 V5 helicopters and has also been designated as its major overhaul agency, a task which I am confident it will execute with remarkable professionalism and commitment. In acknowledgement and recognition of the outstanding performance, I am pleased to award Colours to Air Force Central Medical Establishment and 3 Base Repair Depot. On this occasion, I take the opportunity to acknowledge and compliment the contribution and sacrifice of all the personnel and their families, past and present, of the two establishments, for their dedication, devotion and service to the nation. The nation is indeed proud of you. I wish you and your families the very best and a glorious future. We are indeed proud of you and your achievements.